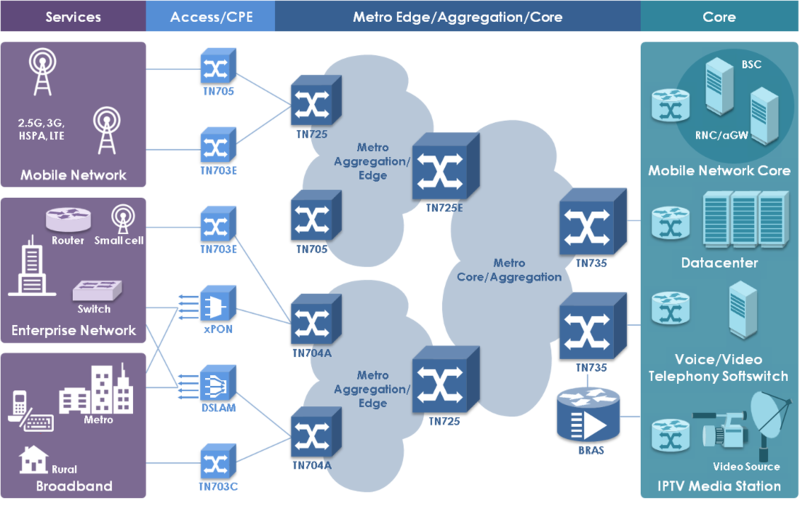 A reliable and scalable Packet Optical Transport Network solution featuring support of wide range of protocols, standards and interfaces coupled with highest reliability and carrier-class set of features. The product line is implemented in a complete line of network elements from compact metro access boxes to high-performance core devices, and offers a broad feature set, including network-wide time/clock synchronization, carrier class sub 50ms recovery resiliency, guaranteed QoS and SLA enforcement, end-to-end multi-layer OAM, and a wide range of interfaces for Ethernet, TDM and ATM services. 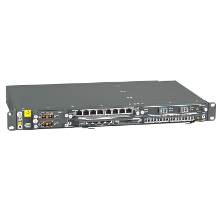 TN703 is a MPLS-TP based compact 1U rack-mount customer edge device that provides data services over an all packet transport. With its Time of the Day over packet and clock synchronization features and support of multiple interfaces, it is ideal for heterogeneous (2G/3G/LTE) mobile backhaul applications. TN703 comes in a 1U package and supports a 44G /6.4G switching fabric. Interfaces supported on TN703 include E1/T1, STM-1 (ATM, CES, POS), FE, GE, 10GE interfaces.